Of and By We The Poor! Independent Indy News! Green Artisan Communities and Music Culture! Support Indy Culture! Poor People's Journal 1 2 3 4 Indy River ROCKS! Dixie Chicks, Neil Young with Promise of the Real and Buds Be a Jahmin'! Love. Peace. Music. Respect. Honor. Family. now checkin' the north fence. former beautiful, wildlife-rich mesquite bosque. caught many tress-passers by sheer luck. Thievery included. and lack of training by a for-profit and corrupt rural provider). a white supremacy and a class-division that must be resisted at all costs. But peacefully, non-violently and relentlessly. AND pursued - every efin' day! Multi-faith Clergy at work and ROCKIN'! against the nomination of former Sen. Jeff Sessions for US Attorney General. on the National Mall one day after the Inauguration. "Gun Violence Affects Us All! In ancient Israel, it was the teenager David who said “Enough!” to the tyranny of Goliath’s loud-mouthed intimidation. In Jesus’ day, it was a young boy who shared his lunch with 5,000 people and, by some miracle, had more than enough to feed everyone and collect leftovers. I stopped by today to tell you that young folk have always been called to led us toward a more perfect union. Barbara Johns was a student like you when she led a walk out at her school in Virginia to protest segregation, starting the movement that led to the Brown v Board of Education decision. When the civil rights movement had lost its energy after the monumental victory of the Montgomery Bus Boycott, it was black students and white students together who started the sit-in movement, led the Freedom Rides, and saved the Movement by forming the Student Nonviolent Coordinating Committee. A little child shall lead them. The prophet declares it and history attests it is true. So we are here today to acknowledge and bless your leadership. You stand today in a great tradition of young people who have helped to transform this nation at moments of great moral crisis. But if we as a people are to follow you toward the country we have never yet been, we must be clear about the crisis we face. Despite your clear and collective cry of “Never Again,” the state legislature in Florida proposed to fight violence with violence and passed legislation that would authorize teachers to carry guns in schools. Jesus told us that those “who live by the sword will die by the sword,” (Matthew 26:52). No good can come from militarizing our teachers in classrooms. There have already been instances of guns accidentally going off in classrooms, yet many politicians think instead of creating stronger background checks, or banning assault rifles, that arming our teachers is the best way to prevent another tragedy. Clearly many lawmakers have been bought by the National Rifle Association (NRA) and are choosing to prioritize their own ambition and wealth over the well-being of our children, families, and other individuals. No one in this nation needs an assault rifle to protect themselves or hunt, yet many of our elected representatives refuse to remove assault weapons from the streets because their campaigns are funded by the very companies that profit from making and selling these guns. Politicians don’t trust young people under the age of 21 to consume alcohol, but they trust them to own guns. The solutions we need are common sense, simple and wanted by a majority of people across this country, yet a majority of politicians refuse to do anything about it. Meanwhile, we have seen 30 mass shootings already in 2018 — more than the the rest of the world has experienced in decades. According to the CDC, nearly 100 people will die today — and everyday this year — from gun violence. Why do lawmakers who refuse to listen to the voices of the American people continue to sit in seats of power? The influence of gun money, through groups like the NRA, is part of the story. But money alone is not enough. The same politicians who refuse to pass sensible gun reform are also suppressing your votes. Since 2010, 24 states have passed voter suppression bills that target African-Americans, Latinos, poor people and students. They accept money from the NRA and then turn around and close down polling places, limit early voting, and gerrymander their districts so that they continue to accept that money and not have to deal with the consequences. We’ve got to be clear about this moral crisis: an extremely wealthy oligarchy is determined to hold onto power by subverting democracy and pitting Americans against one another along the lines of race. But America’s original sin threatens us all in this present crisis. We must be clear about our crisis. If the house is on fire, no one can save just their own room. Violence has tainted the heart of our democracy for far too long. The Second Amendment itself was crafted to equip slave patrols with guns in order to prevent uprisings or retrieve runaway slaves. The state of Virginia required this provision in exchange for their ratification of the U.S. Constitution because numerous slave uprisings had occurred throughout the South and they did not believe that non-slave holding states would invest federal resources to put down slave rebellions. We better read that Second Amendment that the NRA is always talking about. Why does it guarantee the right to bear arms? It says it right there: “A well regulated Militia, being necessary to the security of a free State…” The Second Amendment wasn’t passed to guarantee federal protection of citizens’ rights to hunt and defend themselves. No, states rights was always about the South protecting the property rights of people who believed they could own other people. We’ve never repented of that racism at the heart of this nation’s history. Now, it threats all of our children. The rates of gun violence in the top 10 states with the weakest gun laws are over three times higher than the states with the strongest gun laws. Militarization of our police and racial bias has led to increased violence against communities of color. Young black men are nine times more likely to be killed at the hands of police because of this. Politicians constantly want to throw the blame of gun violence onto gangs — so-called “black-on-black” crime — but this gun violence issue is not a strictly black and white matter, nor an urban and rural matter. This is a national matter that affects us all. Black and white, rich and poor, young and old. How many of our children have to be murdered in their classrooms before Congress decides that enough is enough? How many people have to be gunned down while their heads are bent as they pray in churches? How many innocent bystanders at a concert? A club? Our local and congressional leaders have sat by idly for too long and have allowed too many innocents to die because they refuse to act. But it’s not just the guns that are killing us. It is clear that the extremists in the White House, Congress and statehouses who refuse to ban assault weapons are the same individuals who dismantle affordable health care and let people die. They have reappropriated taxes to the rich, worked to suppress voting rights, stripped away environmental protections, and refused to raise living wages. My sisters and brothers, if we’re going to say, “Enough” to violence, We must challenge all of these violent policies with a united nonviolent movement and massive voter mobilization. The Poor People’s Campaign: A National Call for Moral Revival is linking up with youth movements across the country to say that enough is enough. We will not remain quiet while our children, friends, and neighbors continue to be gunned down. We will rise up and cry out for justice and we will not stop until our voices are heard. If you have had enough of the extremist and immoral agendas that these corrupt politicians are promoting, if you are tired of seeing deaths and violence on your television screens night after night, then I encourage you to join us. others marched in protest to trump tower after a Spiritual Gathering. enlist in the Poor People's Campaign: A National Call For Moral Revival. to stand up and take prayerful #MoralAction." Mayor DeBlasio was there! President Trump’s first year in office was marked by extremism in his administration and in Congressional leadership that shutdown the government by pitting sick children who need health care against scared children who need protection from deportation, all as leverage for building a dehumanizing, unnecessary, and demonic wall. Attacks on communities of color, the poor, and other vulnerable populations have been the policy agenda of this administration — from the enactment of the Muslim travel ban to repeated attempts to take health care from millions of Americans, to open support for white supremacists like Thomas Farr, Trump’s nominee to the federal bench whom Republicans on the Senate Judiciary Committee have already voted to move forward in 2018. We live in a time where states and the administration are actively working to undermine voting rights. In his first few weeks in office, President Trump formed a so-called voter fraud commission on the belief that three million undocumented immigrants voted in the 2016 election. The commission was authorized to seek voter registration data from Texas identifying all voters with Hispanic surnames. Though the commission was discontinued, the administration continues to deny the real issue of voter suppression in this country. With the support of extremists in the Republican-led Congress, President Trump has sought to destroy our economic democracy by enacting an immoral tax bill built on the backs of America’s poor in order to benefit the wealthy. Congress gave corporations a 21 percent tax rate. Now they get to keep 79 percent of their profits, leaving the poor and working class to pick up the tab. We haven’t seen a transfer of wealth this extreme since slavery stole the labor of 4 million women and men to benefit the plantation class. The tax law Republicans have celebrated as their great policy win is a shameless gift to the wealthy that will hurt poor whites, poor blacks, and poor brown communities. State budgets across the country depend on state income, sales, and property taxes as primary sources of revenue for their operating budgets. The tax law will limit the deduction for state and local taxes (SALT). If states wish to prevent this tax hike, they will be forced to make up lost revenue by choosing between cutting critical programs such as education and health care, or forcing vulnerable communities to pay higher taxes. According to analysis by the National Education Association, this could jeopardize state funding for more than 130,000 education jobs, including 2,500 in North Carolina. While President Trump has been so focused on building a racist wall on our southern border, he has failed to build up a functioning infrastructure and an immigration plan that provides paths to citizenship, not punishment for people whose labor has built this nation and who want to make this country their home. As we found in our preliminary report for the Poor People’s Campaign: A National Call For Moral Revival — “The Souls of Poor Folk” — discretionary spending in 2016 allotted almost four times more for the military than for people’s lives at home — with $630 billion for the military versus $183 billion for education, jobs, housing and other basic human needs. Budgets are moral documents and congressional and political leadership at every level should be focusing investments towards our nation’s 140 million poor and working poor people. I’m often reminded of the Prophet Isaiah who said, “Woe unto them that decree unrighteous decrees, and that write grievousness, which they have prescribed; To turn aside the needy from judgment, and to take away the right from the poor of my people, that widows may be their prey, and that they may rob the fatherless.” (Isaiah 10: 1–2). To stand with our immigrant, refugee, and poor sisters and brothers is to stand with God, who calls us to love and welcome the stranger. I cry for all who have been impacted by extremists at the hands of immoral political leaders and systemic policy-violence, but we must remember that President Trump and extremists in the Republican-led Congress are simply a symptom of the real sickness of this nation. There is a moral deficit that allows so many to applaud and pray for this immoral agenda that fails to ensure domestic tranquility, promote the general welfare or establish justice. The most glaring irony is that the very people who embraced Trump’s extreme rhetoric — poor and working whites in the South — are, in raw numbers, the ones who are hurt the most by these extreme policies. It is our moral responsibility to create a country built on policies that benefit all, not just the wealthy. We need a moral public policy agenda that uplifts the poor and communities of color. We must build a country that aims to serve everyone. We need leaders in our government who understand the #StateofOurUnion is divisive and demands a moral intervention. President Trump’s first year in office makes clear that he not only campaigned with extreme rhetoric, but he and all who enable him have made extremism their policy agenda. Standing down is not an option. It’s movement time in America. If you care about the heart and soul of this nation, please join the Poor People’s Campaign: A National Call For Moral Revival in 40 days of direct action starting this spring. To learn more, visit www.poorpeoplescampaign.org. Moral Revival 40-Days of Moral Fusion Launches. National City Christian Church, 5 Thomas Cir NW, Washington, D.C.
in 41 State Capitols Across the U.S.
Rev. Dr. William J. Barber, II President & Sr.
40 State Capitols and Washington, D.C.
6pm ET - First Sunday Mass Meeting! 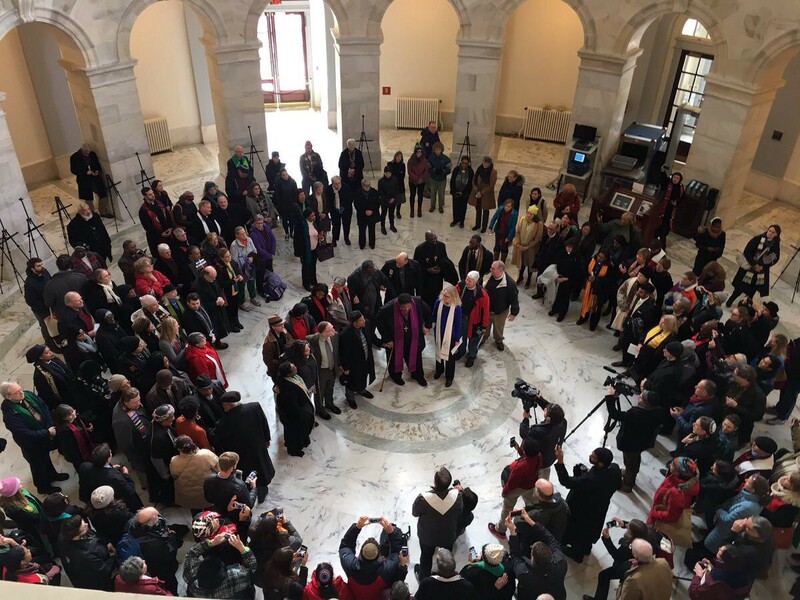 ** Audio*(124 mins) National City Christian Church, 5 Thomas Cir NW, Washington, D.C.
6:30 - 8:30 pm ET – Poor People's Campaign Art Build - Wahington, D.C.
7:30 pm ET – Teach-In**, The Festival Center, 1640 Columbia Rd NW Washington, D.C.
AFL CIO, 815 16th street NW, 20005 Washington, D.C.
7:30 pm ET – Teach-In Tuesdays** - Audio*(86 mins), The Festival Center, 1640 Columbia Rd NW Washington, D.C.
7:30 - 9 pm ET – Justice Arts Movement: Theomusicology and Poetry Night**- Audio*(72 mins) Bloom Bars, Washington, D.C.
7:30 pm ET – Justice Arts Movement: Theomusicology and Poetry Night**- Audio*(72 mins) Bloom Bars, Washington, D.C.
40 State Capitols that are Rockin'-N-Reelin'!